Similar to August, those who are born in October have the choice of 2 birthstones! This month’s stones are Opal and Tourmaline. It's said that both stones came to Earth through journeys involving rainbows. That might be why they’ve been grouped together for October. Australians believed that the creator of the Opal travelled to the planet on a rainbow. The colourful stones were said to be left where his feet landed on the ground. Tourmaline is said to have passed through a rainbow on it’s way up to ground from the Earth’s centre. Egyptian legend believes that this is how the stone got it’s many colours. Carry on reading for more facts about the October birthstones. Due to their shift of colours, Opals are often compared to fireworks and even the galaxy. The stones name comes from the Greek word “opallis”, meaning “to see a change in colour”. There are many different colour variations of this gem. White, black, fire opal, pink and blue. A rare, high quality black Opal can rival the Ruby, Emerald and Sapphire, due to its beauty. They have quite a high water content, ranging from 3% - 21% and they’re a 6 on the Mohs scale. With those 2 factors combined, it makes Opals very easy to crack when they lose moisture. This can be caused by storing them in airtight containers or exposing them to direct light or extreme heat. In Ancient times, the Opal was known as the “Queen of the gems” because it held the colours of all other stones. Opal necklaces were very popular among Medieval maidens who had blonde hair. They thought the stone was guaranteed to protect their hair from losing it's colour. 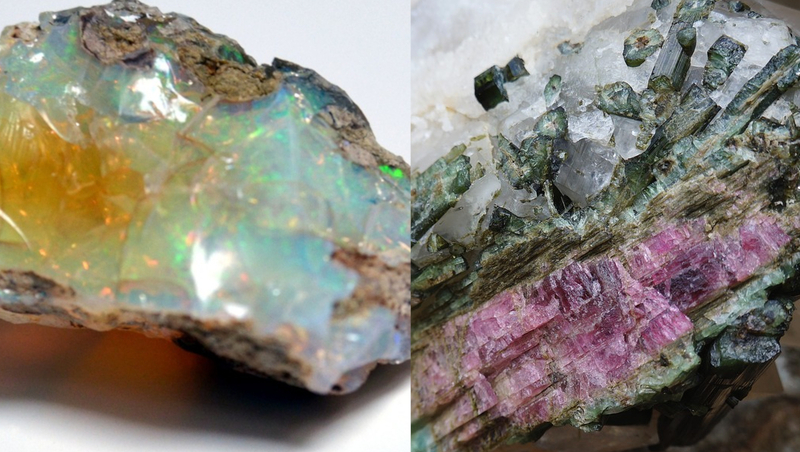 Like Opal, Tourmaline got its name based off it’s range of colours. The Sinhalese words “tura” and “mali” mean “stone of mixed colours”. The gemstone is made up of quite a complex group of minerals. Different elements produce distinct colours. This is a factor that makes Tourmaline so desirable. It’s available in a range of colours and has a hardness of 7 - 7.5 on the Mohs scale. Both of these make it very good for long lasting jewellery. For a long time, Tourmaline has been a symbol of power. It's said to protect the wearer against toxins and pollutants. Also, it's believed to banish negative thoughts and emotions. Which is your favourite of the October birthstones?